OSVALDO's childhood was like that of many boys in a poor urban community. He lived with his ailing mother on a hill on the outskirts of Culiacan, the state capital of Sinaloa, Mexico. His father had abandoned the family years before. His mother worked in a factory, for wages so low that sometimes there was little to eat. Osvaldo went to school, but he often skipped classes to do odd jobs or to play. When he was 13 years old, an event happened that drastically changed Osvaldo's life. He was playing with friends on the roadside outside the family hut, when a truck parked at the top of the hill, and the driver got out. Then the hand-brake failed, and the truck rolled down the steep dirt road toward the children at play. It suddenly pitched off the narrow road, straight into the children. One child was killed, four were injured. Because the driver had not been in the truck (and had slipped the police a bribe) he was not held responsible. After he was hit, Osvaldo - dazed and bleeding - tried to stand up. But he could not move his legs or his right arm. Neighbors took him to the hospital. The doctors found his spinal cord was crushed at mid-back level (T6). He had a double fracture of his right leg, above and below the knee. His right shoulder was broken and dislocated, with nerve damage that left his right hand and arm paralyzed. On his release from the hospital, Osvaldo was taken by ambulance to his home. Unfortunately, neither he nor his mother had been given instructions about prevention of pressure sores and urinary infections. So, day after day, Osvaldo lay on his back on a burlap cot without moving. A month later, when a nurse made a home visit, she found that his back, buttocks, and heels were covered with pressure sores. The hospital then provided an "egg crate" foam mattress, and a nurse instructed the boy's mother to "Turn him frequently from side to side." But this was easier said than done, as his mother soon discovered. Osvaldo had sunk into severe depression which expressed itself as anger, directed mostly at his mother. His paralyzed right hand was extremely sensitive: it gave him unbearable, burning pain, especially when it was moved. He rested it over his chest without moving it for weeks and months. In time, his right arm became stiffly fixed in front of him. He was so afraid of having his painful hand touched or moved that he refused to let his mother get near it. Whenever she tried to move him he would weep and protest. Using his good left arm, he fiercely fought off her attempts to turn him on his side. Because of his lack of urine and bowel control, she had a hard time keeping him clean. 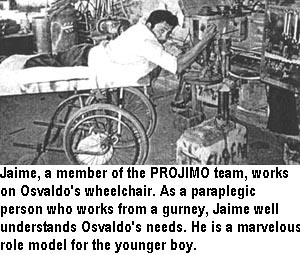 In November, 1991, on a visit to the capital city, two disabled workers from PROJIMO learned about Osvaldo and visited his home. Five months after his accident, the boy was near death. Emaciated, anemic, and very depressed, he had deep pressure sores, a urinary infection and chronic fever. His doctors had not stressed the importance of drinking lots of water to reduce the risk of urinary infection. Adding to the danger, they had not changed him from a permanent catheter (urine-draining tube) to intermittent catheterization (see page 147). His dark urine had so much crud in it that the catheter often clogged. His pressure sores, which his mother did her best to clean and bandage, were infected and had black necrotic (dead) areas. The worst sores were on the back of his ankles. They formed after the visiting nurse - worried about the sores on his heels - told his mother, "Keep a rolled-up towel under his ankles." His mother had carefully followed the nurse's orders. Four months later (when the PROJIMO workers visited the home) deep sores had formed where the towel was still obediently positioned. The sore under the left ankle was so deep that it bared the Achilles tendon. make well-informed decisions, based on their own observations and changing needs. Further complicating Osvaldo's condition was his delicate, often angry mood, his fear of pain or injury, and the excruciating sensitivity of his paralyzed right hand. Yielding to his tearful protests, his mother had given up attempting to turn him onto his side or belly. So, for five months he had lain on his back, his pressure sores getting larger and deeper, and his body growing as stiff as a board. On seeing Osvaldo, the PROJIMO workers felt that - due to the difficult combination of physical and emotional needs - more might be accomplished in their small community rehabilitation center than in the home. They invited him and his mother to spend a while at PROJIMO. At first, Osvaldo was afraid to leave home ... or even to be moved from his cot. But the warmth and concern of the PROJIMO workers gave him a new sense of hope. Gathering courage, he accepted their offer. The next morning, with Osvaldo lying on a foam mattress in the back of a station wagon, the group made the 4-hour trip to PROJIMO. The complexity of Osvaldo's needs called for very caring rehabilitation and innovative assistive equipment. His urinary infection and sores required urgent attention. For the former, the team gave him antibiotics and encouraged him to drink lots of fluids. However, he often refused to drink, even when we explained its importance. Since Osvaldo's favorite drinks were orange juice and hot chocolate, we pampered him with all of these he could drink. As his urinary infection got better, so did his mood and appetite. The team put Osvaldo on a high calorie, high protein, high iron diet. Improving his nutritional status and blood level would help to heal his pressure sores, and fight off the urinary infection. The next job was to find a way of taking the pressure off of Osvaldo's pressure sores. 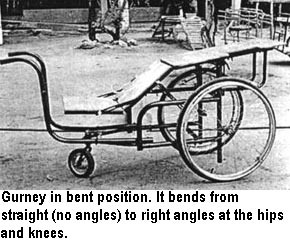 To manage the sores on the back and buttocks, PROJIMO usually builds a gurney, or trolley (narrow wheeled bed), on which the person can lie face down. That way he can wheel himself around, and energetically work and play. Keeping active not only makes lying face down for long periods more tolerable, but it also stimulates circulation, which speeds healing. With Osvaldo, however, lying face down was not an easy matter. From having lain flat on his back for months, his entire body had become as stiff as a board. Also, his paralyzed right arm was almost "frozen," with his forearm over his chest. Both the shoulder and hand were so super-sensitive that he would howl even before someone touched them. The first job was to win Osvaldo's trust and to involve him in the problem-solving process. The team tried to give him a sense of control that would help him overcome his fear. Often, it seemed that his fear of the pain was worse than the pain itself. Certainly it made the pain worse. while doing all of the above, to provide a friendly, understanding, stimulating, entertaining, and adventurous environment - to help Osvaldo pull out of his depression and rediscover joy in life, the will to live, and ability to love. Talking with Osvaldo was not easy. It took time for him to gain enough confidence in himself and in others to speak seriously. What seemed to distress him most was his sense of powerlessness and total immobility. He feared remaining dependent, not being able to do anything for himself, to move, or to go anywhere without help. Therefore, helping Osvaldo learn to do more for himself, manage his personal body functions, and move under his own power were seen as urgent goals which could contribute to his healing in many ways. In these pages, we will not describe all the aspects of Osvaldo's rehabilitation - rather we will focus on several of the most innovative aids and activities. To help meet the various objectives of Osvaldo's rehabilitation - or revitalization - the PROJIMO team designed a number of innovative devices. They will be described here in the order in which they were created and used. Complexity of the problem: Clearly, for rapid healing of his pressure sores, Osvaldo needed to stop lying on his back and start lying on his belly or side. However, the team realized the need to move toward this slowly, at a pace the boy could tolerate and control. Osvaldo was terrified of being shifted to a new position that might trigger the pain in his hypersensitive shoulder and hand. It had taken his last bit of courage just to come to PROJIMO, and the team did not want to push him too hard or fast. In the first days, especially, it was essential that his experience at PROJIMO be as reassuring and uplifting as possible. Therefore the team, together with Osvaldo and his mother, tried to think of ways to reduce the pressure on the sores on his back and buttocks - and to help him regain some flexibility in his hips and knees - while still lying face up. Partial solution: To reduce pressure over the bony areas with sores, Osvaldo was laid on a double foam mattress, the lower one thick and fairly firm, the upper one quite soft. To help speed healing, the sores were packed daily with a paste made of bees' honey and sugar (see page 156). From lying flat on his back for so long, Osvaldo's hips and knees had grown so stiff (with extension contractures) that they almost would not bend at all. Bending exercises were introduced. What was needed, however, was prolonged, very gentle stretching. It would have helped to have a hospital bed that could be gradually cranked up into a sitting position, slowly bending the hips and knees. But such a costly item was out of the question. Partial solution: an adjustable, hinged plywood bed board. Materials: 1 sheet plywood; 2 strips old cloth (about 6 inches wide); white glue. Construction: A piece of plywood the size of the cot was cut in three pieces based on Osvaldo's body measurements (A=feet to knees, B=knees to hips, C=hips to head). The plywood sections were then joined together with cloth hinges made with strips of old towel and white glue. 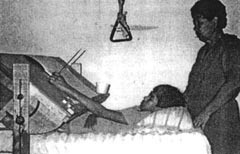 A metal triangle, hanging from a rope over Osvaldo's bed, allowed him to lift himself up periodically with his good arm. This took pressure off his back, and also helped strengthen his arm. By putting padding under Osvaldo's knees, some of the weight could be taken off his backside. This padding reduced the pressure on his buttocks and lower back, where he had some of his worst sores. Padding was also placed under his lower legs, to take pressure off his heels and ankles. By putting boxes of different sizes under the bed-boards, the angle of his hips and knees could gradually be increased. Results: Flexibility of Osvaldo's body returned surprisingly quickly. Within a few weeks, both his hips and knees flexed to almost to 90 degrees. Also, being able to move into a partly sitting position allowed the boy to do more things more easily (eat, read, draw pictures, and take part in what was going on around him). His disposition improved accordingly. And his pressure sores began to heal. Technical problem: With repeated removal and replacement of the hinged plywood bed-board between the two foam mattresses, the cloth hinges began to tear loose. Solution:hinges made of thin cord. As an experimental alternative, hinges were made using cord (thick string). The cord passes through small holes in the edges of the plywood sections. Results of cord hinges: These hinges were as quick and easy to make as the cloth hinges, and they could be used at once (whereas several hours of drying time were needed before the cloth-and-glue hinges could be used). The cord hinges are stronger and hold up longer than the cloth hinges (although this clearly depends on the relative strength of the cord, the cloth, and the glue). The problem: From lying in bed so long, Osvaldo had begun to develop contractures of his heel cords (Achilles tendons). This made it difficult to bring his feet up to 90 degrees. He wanted to do this with the dream of someday standing or even walking - or at least so his feet would be in a good position and he could wear shoes. Osvaldo wondered if there was some way he could do the exercises by himself to regain the flexibility of his ankles. The solution: a flexible foot-board pulled by a rope. Materials: a short piece of thin wood plank; 2 narrow boards about 2 cm. by 6 cm. by 60 cm. long; a piece of rope (about 1 meter); a piece of dense rubber foam (to cushion the feet). Construction: Notch wood, drill hole, and assemble as shown. How it works: The footboard is placed to keep the feet upright (as near to 90 degrees as possible). For his heel-cord stretching exercises, Osvaldo pulled the rope himself. As Osvaldo pulls the rope, the front ends of the side boards sink into the foam mattress, angling the footboard forward and stretching the feet (and heel-cords). Results: The device worked fairly well. The hinge-like action, which allowed the foofboard to angle forward more when pulled, was unplanned and recognized only when tried. The device actively involved Osvaldo in exercises to correct and prevent further contractures of his ankles. Moreover, to do the exercises, he had to move his upper body and shoulders somewhat, which he had resisted doing because of his hypersensitive right arm. So the foot exercises were also good therapy for his painful shoulder and arm. The problem: Osvaldo, who before his accident had been right-handed, needed to develop confidence and skill in using his left hand. He also needed activities to keep him interested and busy during the long periods of lying in a flat or semi-sitting position. For this, he needed a table which could easily be rolled over his bed, and which could adjust both in slant and in height. The group decided that a wooden design, which any village carpenter could make, would be ideal. Solution: Two of the workers in the carpentry shop (Mario, who is paraplegic, and Rafa, who is quadriplegic) designed and built the wooden table shown below. Small bolts with butterfly nuts for adjusting height. Table pivots on bolt passing through curved groove. Butterfly nuts for adjusting angle. Wooden wheels allow bed table to be easily rolled into place, yet provide enough friction for stability. Wooden bar keeps objects from slipping when table is tilted. The bar is attached with wooden rods (dowels) and can be removed when table is flat - for eating, etc. Results: The table was handsome, strong, and it worked well. It was large and solid enough to double as a drafting table. It could also be used as a typing or work table by someone in a wheelchair. This model can be easily made or adapted by a local carpenter. Wooden wheels help keep the cost down. The only welding necessary was to fasten the "wings" on the butterfly nuts. (Ordinary nuts and bolts would work as well, but require a wrench.) For transport, the wing nuts can be removed and the whole table packed flat. The adjustable bed table made it easier for Osvaldo to do many activities in bed. He took particular pleasure in drawing. He began to confront the challenge of learning to draw and write with his left hand. Games. Some of the school children who came to visit Osvaldo made a checker board for him. 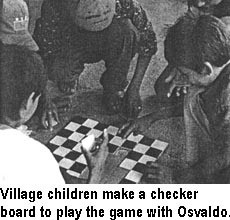 While playing such games with other children, often the sign of a smile would creep over Osvaldo's face. The main disadvantage of the table was its heavy weight and bulky size (as compared to the welded commercial hospital bed-tables that roll in from one side of the bed). Problem: To heal his pressure sores, Osvaldo needed to lie face-down for long periods. However, his paralyzed right arm was stiffly contracted over his chest. The arm was so hyper-sensitive that it would take a long time with therapy to regain enough flexibility to place it out of the way so that he could lie face down. Another problem was how to help Osvaldo regain flexibility (bending ability) of his hips and knees while lying face down. 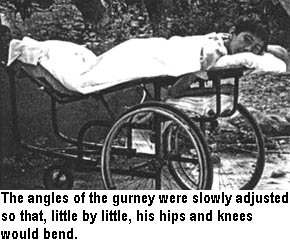 A special gurney could be built for him with adjustable angles at the hips and knees. Actively moving about on the gurney would also stimulate circulation and thereby speed healing of the pressure sores. But the biggest problem was: How could Osvaldo wheel and steer a gurney with one hand? Solution: A one-hand-drive gurney with adjustable hip and knee angles, and with a cut-out section and lower-level table for his paralyzed arm. A rectangle was cut out of the bed of the gurney at the level of Osvaldo's right shoulder, so his stiff arm could rest on a small, cushioned table underneath. A sliding knob is attached by a pivoting bar to a wire cable. The knob slides up and down to change the angle of the rear wheel. It screws down tightly to hold the rear wheel in the desired position. The cable, which passes through a series of D-rings, controls the angle of a single, small rear caster wheel. A lever arm, attached to the vertical post of the caster wheel, is pulled in one direction by the cable, and in the other direction by a spring. 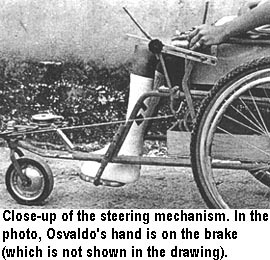 To move straight ahead, Osvaldo tightens the steering knob to hold the rear wheel straight, and rolls the gurney by pushing the hand rim of the left big wheel. To make a turn, he quickly loosens the knob, slides it up or down to angle the caster wheel either to the left or right, and again locks the knob in place. The turn completed, he again moves the knob and locks it in the straight-forward position. 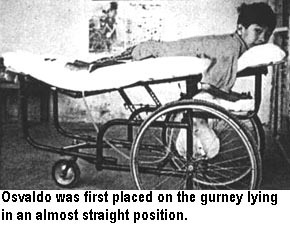 Results: Although it had certain problems and limitations, the gurney was a great success for Osvaldo. Through repeated experimentation, and a flood of complaints and suggestions by Osvaldo, the steering mechanism was gradually improved. At first, too much force was required to make a right turn, and only a very wide turn was possible. But, by placing the D-ring (pulley) nearest the caster further back to provide a pull at closer to 90 degrees, sharper turns could be made, and made more easily. Also, at Osvaldo's insistence, a rack was added on the front of the gurney to hold a large bottle of water (see page 197). This request by Osvaldo reflected his growing interest in making sure he drank enough liquids to avoid further urinary infections. At first it was very difficult to place Osvaldo on the gurney and to position his hyper-sensitive arm without hurting him. But after a few days, the arm began to get a little more limber and the boy learned to help position both himself and his arm. Once in position, he was soon able to stay comfortably on the gurney for hours. 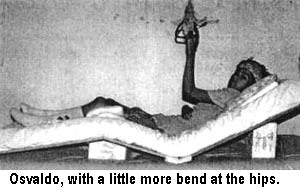 As the angles of the gurney at Osvaldo's hips and knees were gradually increased, the flexibility of his joints improved rapidly. Osvaldo soon began to spend much of the time on the gurney with his hips fairly straight and his knees bent up. The elevated position of his feet helped to prevent them from swelling. This, in turn, helped his ankle sores to heal. It helped to heal his sores by removing the pressure on them (by his lying face down). 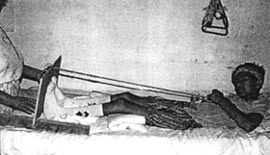 Also, his energetic activity on the gurney improved his circulation, which helped the sores to heal faster. 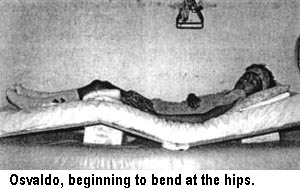 The hinged bed of the gurney helped to correct the extension contractures of his hips and knees, by gradually increasing the bend of its jointed sections. 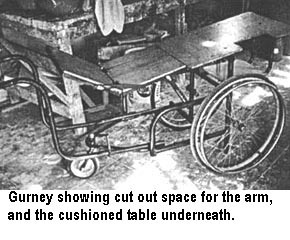 With its one-arm drive, the gurney allowed him the freedom of self-controlled and self-powered mobility. This greatly improved his outlook on life and on himself. By encouraging physical activity and more drinking of water, the gurney helped to prevent urinary infection and kidney stones. 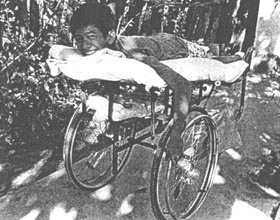 Wheeling himself around on the gurney helped to strengthen his more useful arm, providing therapy that was both functional and fun. Altogether, the gurney gave him new self-confidence and improved his state of mind. His greater happiness was due partly to being able to go where he liked under his own power, and partly to his participation in designing and improving his own equipment. The role model of other disabled persons who ride and work on gurneys helped a lot. Once Osvaldo's pressure sores had healed and he regained enough flexibility so that he could sit, he needed a one-hand-drive wheelchair. Occasionally, PROJIMO has a second-hand hemiplegic wheelchair donated from the cooperating hospitals and programs in the United States. But at the time Osvaldo needed one, none was available. Solution: Like many rehabilitation programs in the Third World, PROJIMO has a big need for an easy-to-build, low-cost, hemiplegic wheelchair. 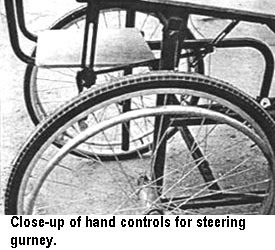 It occurred to the workers in the shop that the same front-wheel steering mechanism used for Osvaldo's gurney might work for a wheelchair. Through a lot of trials and suggestions by Osvaldo, a design was created. A single front caster was controlled by pulleys and cable to a steering knob mounted on a vertical bracket on the left side of the chair. Trial construction, trouble-shooting, and improvements. 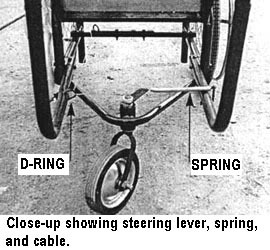 In the early design, the very small D-rings (improvised front pulleys) gave too much resistance and made steering difficult. In the modified design, larger, smoother-running pulleys were used. This made steering easier. Pulling on the lock-knob required too much force for Osvaldo (whose back was still painful). Therefore a longer lever-arm was added. After several modifications to make steering easier, Osvaldo found the chair very useful. He learned to steer it with remarkable agility and became relatively independent. The strength in his left arm increased. The removable arm rest on the right side, plus the easy access for his feet, made putting him in and out of the chair relatively simple. He soon learned to help with the transfers, using his left arm. One disadvantage of this design is its lengthy forward extension to support the steering wheel. This makes moving about in close quarters more difficult (although far less so than the front-wheel-drive tricycles with a bicycle wheel at the front, which are even longer and more cumbersome). On the positive side, the narrowness of the "nose" of Osvaldo's chair, and the small front wheel, make moving about in close quarters somewhat easier. 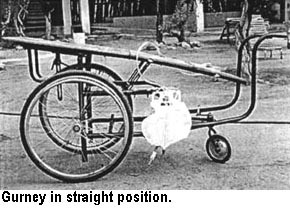 In conclusion, the Osvaldo one-hand-drive wheelchair provided a relatively low-cost, easily constructed option in situations where standard hemiplegic chairs are seldom available, too costly, and not durable. Although to our knowledge this new wheelchair has not yet been duplicated, we feel it has the potential to help fill the enormous unmet need of hemiplegic wheelchair riders in low-income situations. However, the design still needs to be simplified and improved. One possibility might be to shorten the forward extension to make it easier to move about indoors. For another, better design of a one-arm wheelchair, see the next chapter (page 253). Following his accident Osvaldo lay on his back for 5 months without being turned. When he came to PROJIMO he had 11 pressure sores, extending from mid back to his heels. The largest sores were 2 to 3 inches across. Most were fairly shallow (bone not exposed) and his mother had kept them fairly clean. However, there was some dead as well as unhealthy gray tissue on the surface of the sores. The deepest sore, about 2 inches long, was over the heel cord (Achilles tendon) of his left foot; the tendon was exposed. Complicating treatment of Osvaldo's pressure sores was his hypersensitive paralyzed right arm, which had become rigidly contracted over his chest. This stiff, painful arm prevented him from lying either face down, or on his right side. Putting cushions under his legs to take pressure off his buttocks, lower back, and ankles/heels. Providing a ring so he could lift himself up. Using a thick sponge mattress. 2. Adequate cleaning of the sores; treatment with sugar and honey. 3. Wheeled mobility while lying face down, with the feet up (until the sores heal). 4. Lots of activity to speed up circulation, which causes faster healing. 5. Food rich in calories, protein, and iron to strengthen the body and blood, to speed healing. 6. Management of the boy's overall health, especially his urinary system. 7. Strengthening the good arm and increasing his ability to change his position. 8. Encourage the boy's understanding and responsibility in healing and preventing pressure sores: above all, changing position and lifting up the body often. Treatment involved daily washings, at first brisk enough to remove dead flesh. Once the healthy red flesh was exposed, cleansing became quite gentle so as to avoid damage to the newly forming tissues. After cleaning the sores, a paste of bees' honey mixed with sugar was applied to the sores and covered lightly with gauze (see page 156). Results: With this treatment program, combined with the management techniques reviewed on page 251, the sores healed remarkably fast. Even the deep sore over Osvaldo's heel healed in 3 weeks. The team feels it was the combined actions of treatment and management that led to rapid healing. Surely the change in Osvaldo's attitude made a big difference. He began to oversee and take responsibility for his own care, advising his mother and other attendants about how to place padding to relieve pressure over bony areas, and asking to be turned or moved after a time in one position. His increased physical activity also probably contributed to his quick healing, as did the many hours he spent each day lying face-down on his specially designed gurney. Comparison of PROJIMO's methods with hospital treatment of Osvaldo's pressure sores. The steel rods surgically placed in Osvaldo's back after his accident came loose, and had begun to poke through the skin. To remove the rods, Osvaldo was taken to an orthopedic hospital in California. During the 2-day drive, a new small pressure sore formed over his sacrum (bottom part of the spine). In the hospital, Duoderm (a costly, medicated, absorbent bandage) was put over the sore, and Osvaldo was placed in bed for 24 hours a day. He lay on his back on a special air-flow mattress run by an electric air-pump, so that the pressure over each small area of the body was constantly changing. In the hospital, with all this costly treatment and equipment, the boy in his space-age bed was deprived of all choice or responsibility for his own care. His pressure sore - smaller and more superficial than ones that had healed in 3 weeks at PROJIMO - took over 2 months to heal. Ironically, from lying flat on his back for so long in the hospital, Osvaldo's knees and hips were again becoming rigid. A physiotherapist, attempting to restore flexibility, used too much force and broke his right leg. With his leg in a cast for weeks, a new deep pressure sore formed on his right heel. Again, it took over 2 months to heal. During all these months in the hospital, Osvaldo's anger, hostility, and depression - which he had gradually been overcoming - re-emerged. The nurses were at a loss for knowing how to get him to cooperate. Comparing results of Osvaldo's management at PROJIMO with those at this modern orthopedic hospital, it appears that the comprehensive, action-oriented, whole-person approach used at the village center was relatively successful - at least for the healing rate of pressure sores. The rapid healing, achieved with Osvaldo's sores has occurred with many (but not all) persons attended at PROJIMO. More comparative study is needed.